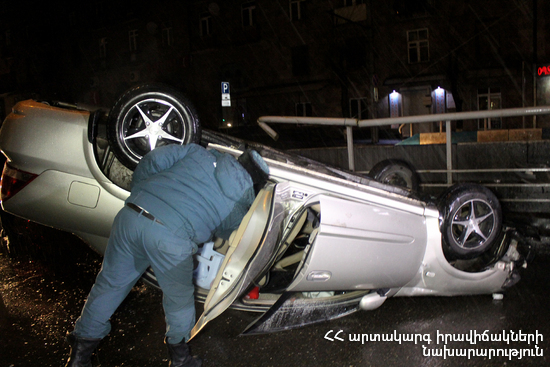 On May 15, at 00:14 an emergency call was received to "911" service that a car accident had occurred on Myasnikyan Avenue, Yerevan: the rescuers’ help was needed. It turned out that a "Renault Logan" belonged to taxi service “Malina” had overturned: there were no casualties. Before the rescuers arrived at the scene the car had been put back onto its wheels by local forces. The rescuers disconnected the automotive battery of the car and put back the cover of a nearby open manhole.